What you wear and how you look does matter! Always err on the side of professional and consider wearing a suit, but make sure whatever you wear is clean and wrinkle-free. Furthermore, make sure your hair is tidy, shoes are neat and accessories are conservative. If you look polished, your interviewer will remember you as a professional. 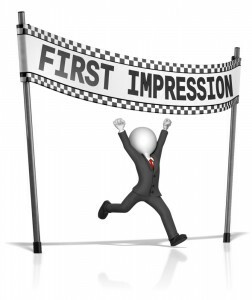 Nothing hurts a first impression at an interview quite like arriving late! However, arriving too early can disrupt the interviewer’s schedule and throw off his/her day. So when is the best time to arrive to your interview? The “sweet spot” is 10 minutes before the interview starts. The person at the front desk or walking by may not be your interviewer, but you should still be warm and friendly. Of course, it’s the polite way to act, but some hiring managers ask receptionists about candidates’ demeanors when they came in. Arriving prepared to an interview is essential. Bring copies of your resume, a pen, notepad and portfolio of your work (if applicable to your industry). Also, make sure you’re prepared with knowledge about the company and position, so you can better engage in conversation and ask thoughtful questions. An interview is so much more than just your spoken words; nonverbal communication plays a huge part. Handshakes, smiling, tone of voice, hand gestures, posture, eye contact – these are all cues hiring managers pay attention to throughout the interview, so be cognizant. To learn more about nonverbal communication, check out one of our recent blog posts. Finally, put your phone on silent, not vibrate. The light humming of a cell phone is a major distraction and will take the interviewer’s attention off what a great candidate you are and instead make him/her think you’re unprofessional. This entry was posted in Job Seekers and tagged First Impressions, good first impressions, interview tips, Job Interviews. Bookmark the permalink.